Figure 1. Northern Hemisphere average annual surface air temperature variations over the last millennium from proxy, historical and instrumental observations (IPCC, 2001a). Temperature reconstruction and instrumental data from AD 1000-1999. Smoother version of NH series and two standard error limits (gray shaded) are shown. for assessing the background natural variability of climate, to place 21st century changes in context of which both modern and traditional agricultural and forestry systems developed over the past millennium. Palaeoclimate proxy indicators (Folland et al., 2001) include tree rings, which provide precisely dated annual information, corals that provide information on past variability of the tropical and sub-tropical oceans and ice cores from polar regions of Greenland and Antarctica, which can have annual resolution. 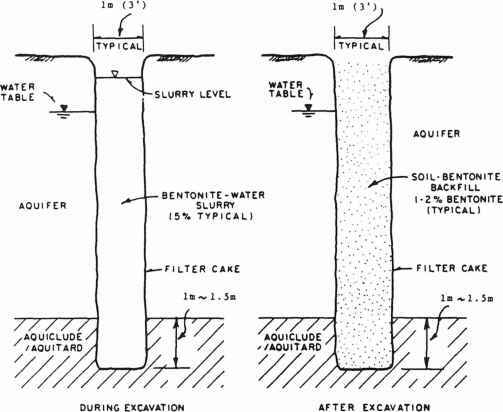 Other information can be gleaned from borehole measurements, which provide broadscale temperature trends, historical documentary evidence particularly from Europe and China, and mountain glacier moraines providing evidence of past glacial advances. 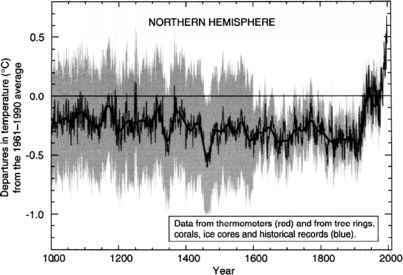 From these sources there is enough evidence to reconstruct temperature patterns over the Northern Hemisphere back to AD 1000 (Folland et al., 2001). These reconstructions show a slow cooling peaking around AD 1450 and 1880 over the last 1,000 yr, with the most recent cool period being around the end of the 19th century. Lamb (1982) has documented the downturn of climate in the North Atlantic/European region commencing with the storminess and cooling and wetness of 14th century Europe. Desertion of farms and village settlements are noted all over northern and central Europe. The prevailing wetness led to more prevalent disease. During the late 1500 s many years of general death and famine occurred in Scotland. For Norway extremely stormy years are noted in the 1600 s with changes in fisheries around Scandinavia. Documentary evidence by Pfister et al. (1999) illustrates the impacts of climate excursions of similar magnitude (of the order of 0.2 °C) that occurred in late 16th century Europe on agricultural commodity prices and wine production. A clear link is made with grain price fluctuations. Wine yields and prices show a more dramatic response. The interannual deterioration from 1586 to 1587 decimated yields, with wine prices jumping and beer sales tripling in the 1590s. It is interesting to note though that for the Northern Hemisphere the coldest period occurred in the late 15 th century when temperatures were 0.5 °Cbelowthe 1961-1990 average. Evidence for Southern Hemisphere temperature trends in past centuries is quite sparse. There is evidence of some large-scale hydrological changes, which are best documented by lake levels in Africa (Nicholson, 1989). Measurements of global-average air temperature of the land surface are available from thousands of station records distributed over the land surfaces of the globe. Marine temperature series have been derived from sea surface temperature (SST) and night marine air temperature records from ships. These have been blended and area averaged to produce anomalies of globally averaged surface air temperatures shown in Figure 2. The global average of the surface air temperature has increased by about 0.6 ° C since about 1860, the earliest date for which sufficient data for global estimates are available to present. New analyses indicate that the warming in the 20th century is likely to be the largest of any century during the past 1,000 yr for the Northern Hemisphere, as indicated by Figure 1. Further, on a global basis, the 1990s were the warmest decade and 1998 was the warmest year since 1860. Two periods of temperature rise occur: one between 1910-1945, where the global temperature increase was 0.14 °C, and the other from 1976-1999 when temperatures increased by 0.17 °C. The distribution of temperature increase is shown in Figure 3. The warming observed in the period 1910-1945 was greatest in Northern Hemisphere latitudes. In contrast the period 1946-1975 shows cooling in the Northern Hemisphere relative to much of the Southern Hemisphere. For the most recent period (1976-1999) increases in average temperature have been greatest over the mid-latitude of the Northern Hemisphere continents, particularly in winter. There has been relatively faster warming of land-surface temperature than of the ocean surface temperature in the last 25 yr of the 20th century (Figure 3). Figure 2. (a) to (c). Combined annual land-surface air and sea surface temperature (SST) anomalies relative to 1961 to 1990 (°C) 1861 to 1999, calculated using optimum averages of United Kingdom Meteorological Office ship and buoy and Climatic Research Unit land surface air temperature data (bars and solid smoothed curves) taken from Folland et al. (2001): (a) Northern Hemisphere; (b) Southern Hemisphere; (c) Globe. The dashed smoothed curves are corresponding area weighted averages, updated from Jones et al. (2001). the frost-free season in many mid- and high-latitude regions (Figure 5). Analysis of numbers of days with air frost (days with minimum temperature below 0 °C) across much of the globe (Frich et al., 2000) shows a reduction in the order of 10%. Overall, global land precipitation has increased by about 2 percent over the 20th century (Hulme et al., 1998). This increase is neither spatially nor temporally uniform (Figure 4). Over the mid- and high-latitudes of the Northern Hemisphere precipitation increased by between 7 and 12 percent between 30 and 85 °N, especially during the boreal autumn and winter, but these increases vary both in space and time. Over North America precipitation has increased in the order of 10%, a 5% increase in western Russia and a slight decrease in eastern Russia and China. This general increase contrasts with decreases in the northern sub-tropics. Record low precipitation has been observed in equatorial regions in the 1990s. Small increases are observed in the southern sub-tropical landmasses. Figure 3. 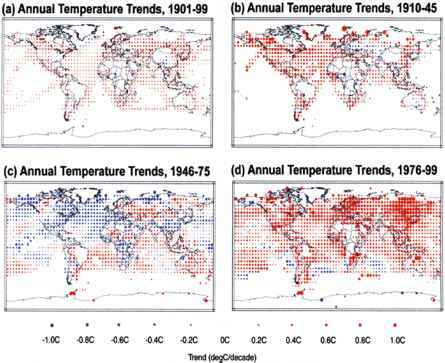 (a) to (d): Annual temperature trends for the periods 1901-1999, 1910-1945, 1946-1975 and 1976-1999 respectively. Data from Jones et al. (2001). Trends are represented by the area of the circle with red representing increases, blue representing decreases. Trends were calculated from annually averaged gridded anomalies with the requirement that the calculation of annual anomalies include a minimum of 10 months of data. For the period 1901-1999, trends were calculated only for those grid boxes containing annual anomalies in at least 66 of the 100 yr. The minimum number of yr required for the shorter time periods (1910-1945, 1946-1975, and 1976-1999) was 24, 20, and 16 yr respectively. Figure 4. 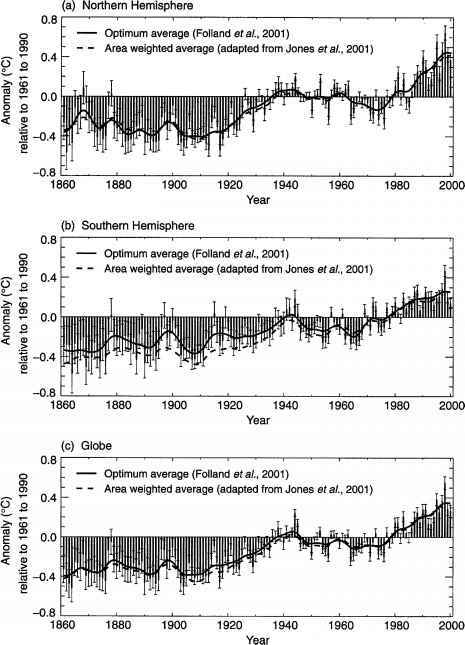 Annual trends for the three periods of changing rates of global temperature of figure 3 and the full period, 1900-1999. During the 100 yr period, calculation of grid cell trends required at least 66% of the ys without missing data and at least 3 yr of data within each decade except the first and last. During the shorter periods, calculation of grid cell trends required at least 75% of the years without missing data. Stations with more than 1/6 of their data missing during the normal period and grid cells with more than one season or year without any measurable precipitation during the normals period were excluded from consideration. Precipitation trends are represented by the area of the circle with green representing increases and brown representing decreases. Annual trends were calculated using the following method. Precipitation anomalies in physical units were calculated for each station based on 1961-1990 normals and averaged into 5 ° x 5 ° grid cells on amonthly basis. The 1961-1990 monthly mean precipitation for each grid cell was added to the monthly anomalies and the resulting grid cell values summed into annual totals. 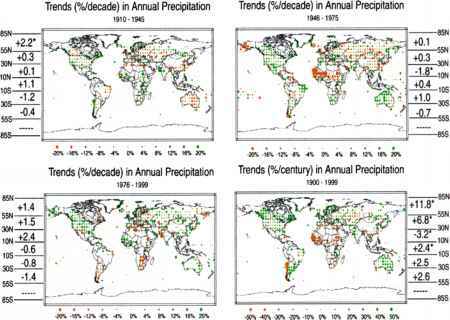 This serieswas converted into percentages of normal precipitation, and trends calculated from the percentages. Average trends within six latitude bands are shown in the legend of each map. The 1961-1990 monthly mean precipitation for the latitude band was added to the anomaly time series and the resulting values totaled across all months within the year. The significance of each trend (based on a 0.5 level) was determined using a f-test and a non-parametric test statistic. Trends found to be significant under both tests are indicated with a '*'.